We often are asked for resources on a variety of topics so I am creating a space here to share readings, books, videos, modules, movies, that we use and love. If you have resources, send them our way! Not sure I love this video but it’s assigned in my course this week so we’ll see what kind of discussions come from it. This article had me thinking today about all the ways college professors have historically and may still get in the way of student learning. So, I wrote a quick little response. It’s just a start. Forget your privilege. You went to college, for many years, and many brilliant people helped you get where you are today. You are a college professor because your doctoral advisor saw potential in you, taught you the wily ways of academia while guiding your research, your writing, and your learning. Doctoral programs are an amazing opportunity to read, talk, learn, grow. You had that opportunity. You are undoubtedly changed from the experience. Yes, it was hard. Yes, you made sacrifices. Yes, you had uncaring professors along the way. But you had an opportunity that many only dream of. Never forget that. You have also earned your degrees. You’ve secured that much sought-after tenure track/tenured position. You have accomplished so much. But can you really not remember what those undergraduate days were like? The stress, the lack of sleep, the bad food, the no money, the roommate stuff? Require expensive books. Particularly when you then assign only two chapters. Choose accessible readings. Provide multitudinous means of accessing readings. Assign readings intentionally and engage students in applied learning to grow their surface understanding from the reading. You’re the expert. Teach. Assume. Unless you have trust with your students, you can only assume you know nothing about their lived experiences. Use Grades As Punishment. Grades should reflect progress toward mastery of content. Period. That’s it. That’s what grades are. Communication about learning. If you use grades to threaten, punish, or coerce students, you’re doing it wrong. Docking a letter grade for a late assignment is unethical. Maybe try asking the student why the assignment was late, or better yet, have a relationship with the student that allows her to come to you first. Office Hours Only. You do know your students have full lives outside of your course, right? They have jobs, maybe kids and families, other courses, commitments, responsibilities. If you set your office hours at the time convenient for you and you are inflexible in meeting with students outside of that time, you are communicating that your time is more valuable than your student’s. Think Your Time Is More Valuable Than Your Students’. It’s not. Expect Students To Improve Without Feedback. Feedback is teaching – it’s an iterative process and, as the teacher, your participation is required. If you hand back papers with letters or points on the top, your students have no information about how to improve. Assessing learning is feedback for you on your instruction, your assignment, your students’ learning. Provide transparent feedback so your students can progress toward mastery of the content. Yes, it takes more time – it’s also your job, do it well. Fail To Teach. Additionally, if students address you inappropriately in an email, provide them feedback to improve. As a female professor, I invariably get emails addressed to Mrs. Newton. I reply with a “Hi, Student, my name is either Dr. Newton or Jen once we’ve actually met in person.” Guess what. That’s all it takes. Rather than being frustrated or writing a heated, ego-driven post on social media, provide feedback, tell students what you expect, allow them to meet your expectations. Waste Students’ Time. Busy work, extraneous readings, anything that does not result in extending students’ depth and breadth of knowledge, is a waste of time. Sure, you can assign anything you want, you can give students 10 points for bringing a dog to class and they will beg, borrow, and steal to get a dog, but what are you teaching? That teachers are manipulative and that learning is at least secondary to control. Use their time wisely. Shame or Condescend Students. To colleagues, friends, on social media. Ever. Every time I see one of those “It’s on the syllabus” memes, I die a little inside. You are imperfect. You forget about the occasional faculty meeting, deadline, oil change. Hopefully, there are people in your life who help you out. Maybe you could be that person for a student. Yes, they’re imperfect. So are you. Choose empathy. We know students don’t really read the assigned reading, right? There are loads of reasons for that. Textbooks are cost prohibitive, the reading is cumbersome, too long, irrelevant from the student perspective, it’s tedious . . . just to name a few. As instructors, we implement various strategies to encourage, incentivize, motivate/manipulate students into doing the reading. Reading checks. Guided notes. Entrance tickets. Summary notecards. Come with three questions from the readings. Because the point is the reading, right? Not the reading check. But by assigning point value to the reading check, that is why I was communicating was important. And I didn’t actually believe the reading check itself was important. I did more reading on the evidence and rationale in the “ungrading” model and decided to move my gotcha points into partnerships. This is where commitment logs were born. Commitment logs are individual, self assessment accountability tools I use to engage students in their own learning. I set learning intentions and success criteria for the class session but I ask students to set their own learning intentions and success criteria for our time together. Sometimes students will write something like “I will stay awake for the whole class” or “I will learn three new things.” Wherever they are, I’m good with it. It’s not fancy. It’s just an ongoing commitment to their learning, their own accountability. Because some days their heads and hearts are not in my engaging, brilliant pedagogy. And that’s okay. They set goals for themselves. And, more often than not, they exceed their goals. I think there is something to the act of writing it down, of focusing on an intention, that allows them to attend to their time in class with me a little differently. Reading checks never affected engagement. Commitment logs do. At the end of class, they make an exit statement. They write about if they met their success criteria, why they did or did not, what they learned, remaining questions they have, concerns they experienced during class, anything they want. And I respond to every single one prior to our next meeting. I did ask a midterm and final course evaluation question about the commitment logs. Students were overwhelmingly positive about the activity. Since, I respond to each person each week, I am also able to keep a quick record of our relationship as it develops, the student’s self perception and assessment, and concerns or questions that appear more than once across students. It has unexpectedly provided a relationship-building strategy as well. I’ll post the blank document here for anyone who may want to try it. Let me know how it goes for you! How do you engage your students in their learning and in self assessment? I have dreamed of this moment for seven years. A fantasy from 11th grade still replays itself in my mind with crystalline clarity: My first day of school as a teacher. I’m wearing all professional black clothes with my hair slicked back in a bun. I’m stricter than I need to be because I want my students to take me seriously. I’m cool and aloof and ooze authority and respect. I talk about learning and brain growth and the value of hard work until we suddenly have an inspirational “Dead Poets Society” moment. The students leave, backpacks slung over one shoulder, talking about how they can’t wait for tomorrow. They jump, fist in the air – and freeze frame! My real first day was nothing like that. When I realized that baseline data must be collected before I could implement any learning community activities as per my goal and research this year, I immediately accepted the fact that my students’ first day of class with me would be… unorthodox. I stood at the door as they walked in, asking each student to say their name as they wrote it down so that the first time I heard it would be the correct way to pronounce it. The first thing they saw upon entering the room was a sign saying, “Welcome to Physics! Grab a baseline survey from the Pick Up station (near the door) then take a seat and begin the survey.” Once the bell rang, they had seven more minutes to complete the survey before I gave my two minute introduction to myself and to the course. The rest of the class was spent doing a Group Juggle with squishy bird shaped toys in order to start getting the students comfortable and familiar with each other. Norms and expectations are easiest to establish at the beginning of a group’s existence. That means that the best time for me to introduce the notion of a learning community was the first day of school. So, as unorthodox and abrupt as it sounds to have the students silently submit a ten-question survey about learning communities as soon as they walked in on the first day, it was a necessary action in order to get the least biased baseline data that I could. Well, if I had been more zealous in my quest for unbiased data, I probably could have covered up our giant community calendar and “Welcome to Our Physics Fiesta!” decorations but I put a lot of trust in the students being slightly too overwhelmed by their first day of school to be so analytical of the wall decor. The baseline survey consisted of two free response prompts and eight Likert scaled prompts that asked students to circle a number between one and eight where one implied that they “strongly disagree” and eight meant that they “strongly agree”. Heather had given me some advice and information about the benefits of using more versus fewer and even versus odd numbers on the Likert scale. I decided upon a scale of eight quantitative points because an even number denies the students an opportunity to respond with a true neutral. I also chose eight points on my Likert scale because it would allow me more clarity into the differences in the students’ choices than a smaller number would while still remaining mangable for me to record by hand. With the prompts, I tried to tease out what students knew about community oriented learning and how they felt about it. I, too, am taking on the power of yet. I’m on a steep, but manageable, learning curve when it comes to my lesson plans and preparing materials. While each day of class so far has left me in love with my new job and with the communities we’re building, I’m not quite at the level of preparation that I’d like to be… yet. I will get there, I know it. With practice and experience, I will leave behind twelve hour (or more) days at school. There will come a day when I have nearly everything for the next week planned and printed the Friday before. So too will the day come when I will write these blog posts when I mean to write them instead of a week later like I did with this one. I’m not too worried and I’m not letting any of these current slips or shortcomings overwhelm me with personal disappointment. Heather and I have talked about this project being my “lizard’s tail”- the thing you never want to drop, but can lose if necessary to survive. I’m nowhere near needing to drop my “lizard’s tail” but I’m glad to feel secure in my plans and priorities. New teachers and veterans, what is your “lizard’s tail” this year? We are so fortunate in that we often have the opportunity to partner with teachers in learning, problem solving, and improving practices. 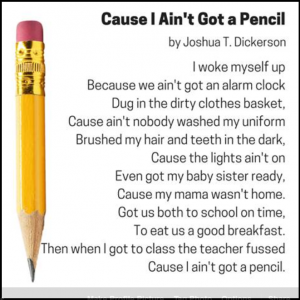 Inevitably, across various contexts and grade levels and locales, teachers report frustration with students for not having pencils. We kept hearing it. We’d ask questions like, “What frustrates you so much about the pencil issue?” and the responses were varied. Some said it was an indicator of showing up unprepared, a lack of respect for them or their class, a lack of responsibility. But, for us, it always felt like a resource issue. Teachers should have all the pencils they need to engage their learners in all the ways. When we are confronted with beliefs about what kids “should” do or have, we are always mindful of all the ways we – as adults and professionals – drop the ball. We are often without a writing utensil when we need it most, yet there is always someone nearby willing to share. We know these teachers would give us a pencil if we asked! They would never tell us we were disrespectful for not having one or take it as a lack of our preparedness for our time together. It happens. People forget pencils. And all kinds of other things! But, for some reason, kids not having pencils was a very frustrating and pervasive problem for teachers. The more we talked about it, the more it seemed like it was not really about pencils at all. It was about resources. Supplies, yes, but also time! We have seen teachers tag their pencils with identifying markers and create check in/check out systems for pencils, some schools have pencil machines next to the soda machines! So, we thought maybe this is a small way we could alleviate a huge frustration for teachers. We could get pencils to teachers and kids. Lots of pencils. Loads of pencils. Enough pencils that no one has to man a sign in/sign out for pencils or sweat a broken pencil, or worry about trying to find one on the floor to avoid being in trouble. What if we could just get pencils to teachers? Would that one teeny tiny thing do anything at all to take a teeny tiny load off teachers’ overwhelming list? We crowdsourced pencils from our friends and families generosity using social media and Amazon wishlists. We connect directly with teachers using teachingisintellectual’s Instagram and send as many pencils as we can to each teachers’ request. We take pencils to every professional development we get to do now because it is one small thing we can do for our teacher partners. We’ve distributed over 20,000 pencils now and we hope it’s just the beginning. We advocate for fully funded public education and will continue to fight that fight. Meanwhile, we will contribute as many pencils as we can to as many teachers who need them. Drop some pencils off at a school near you today. Do it again next month. Kids need pencils and it is something you can do. And pay off an overdrawn lunch account while you’re there too. Yell and sit…sit and yell, get a little louder, be a little firmer…they’ll eventually listen-right? I walked into a room recently where an educator was sitting on a bench demanding that the kids stop! She kept saying “I said stop, stop!…(a little louder) Stop it NOW!…(even louder) I said STOP STOP STOP!” Her face was turning bright red and she was clearly frustrated. Teaching isn’t easy, we all get frustrated, patience is hard, so, so hard. We are all human. We all have emotions. But, I want to encourage you think about this question: how does yelling help? Children are in tune with adults more than we like to admit. They read our body language, notice our facial expressions, and feel our emotions, sometimes as if they are their own. Children’s frontal lobes are still developing, this is the part of the brain that helps us control our emotions. It’s our job to help nourish that development, help it grow. That’s what we do as teachers-right? Just as you might spend extra time with students working on letter sounds or multiplication facts, we MUST spend time developing social-emotional skills. With this, it’s also important to constantly remind ourselves that their brains are growing (yes even in the teenage years). We also must remember that students need varying levels of support recognizing, managing, and expressing emotions. (I know, this is a lot, you already have so many other things you must teach and fit into your day, that curriculum map is just haunting you at night!) However, research shows that learning can’t happen without self-regulation, trust, feelings of safety –from both peers and adults—all of which are part of social-emotional development. So how can we do this? The teacher I described above was trying to get her students to lower their voices. They didn’t hear her, they were engaged in a game, and instead of complying to her demands, they just matched her volume and continued the activity. She was frustrated and angry. I get it. But to be honest, I don’t know that they even knew she was talking to them, or understood what it was that she wanted them to “STOP!” Instead, they matched or modeled her tone, her yelling. Wait. Sometimes kids only respond to yelling…right? Wrong. It might seem like it to us, as adults. Perhaps, because once our faces have reached a certain level of red or we’ve stomped and made enough noise we get their attention, or scared them, they comply? Let’s be honest though. Yelling isn’t fun for anyone, including the yeller. Besides the obvious—sore throat, exhaustion, anger— it also causes an increased amount of adrenaline and stress hormones for ALL parties involved. When is the last time you screamed at your students and said— alright good, that felt great, time to get back to learning those multiplication facts? I want to challenge you to consider the difference between a reaction and a response. The dictionary definition of reaction is: an action performed or a feeling experienced in response to a situation or event. The dictionary definition of the word response is: a reaction to something. Despite the concise dictionary definitions, there is a difference and it matters! ReACTion has the word ACT in it. When we react to something it’s typically a more immediate action that comes from an event or situation that occurred. When reacting we often don’t take time to think or process the situation, instead we jump into flight or fright mode and act. For example, a child just knocks over the entire tub of papers (after you have asked them to stop running in the room multiple times). You’re frustrated, you yell, you demand they pick it up, or lose recess for not listening, you REACT. Next, let’s look at RESPONSE. If you just look at the dictionary definition you could argue that the above example is a response as well. I won’t disregard this point, but I want to encourage you to think about a response with a different mindset. Response = thoughtful and intentional action. Where you take a quick moment, that deep breath, you try to remind yourself that your student is still learning. You are the teacher. You find empathy. Remember, mistakes are okay, they help us all learn. So that child knocks over that paper and instead of yelling, you take a deep breath, quietly walk over to the child, make a plan for how to pick it up, help them re-focus, teach them how to self-regulate, model that response. With calm. With words. You respond with understanding and through a teaching lens, not with anger. Not with yelling. I know this is hard. You won’t be perfect. We all slip, we are all human and sometimes even our own emotions get the best of us in front of students. But every moment that you can remind yourself to RESPOND instead of react is another moment that you are modeling self-regulation, communication, and helping your students develop the social-emotional skills that are key to successful learning. I think often about students I have worked with who are in their early years of their teaching career. I remember my early days in the classroom, feeling prepared and ready for the year, but eerily aware that there were many unknowns: student strengths and instructional needs, district and school policies, and the curriculum to plan, write, and prepare. There was no formal induction support, but I thrived with several informal mentors. I also knew other teachers who weren’t feeling successful and supported. As a result, they often left teaching after their first few years. I served as an induction year mentor after my first two years of teaching. It was important to me to help other teachers succeed in their early years in the classroom. In addition to mentorship, research on effective teacher induction support programs suggests there are many ways we can support new teachers, including: workshops and seminars tailored to new teachers, targeted professional development, reduced workload, and common planning time (Ingersoll & Strong, 2011). Flash forward to the present… I am now an assistant professor. I am well versed on the evidence about creating effective teachers and interested in retaining effective teachers, especially in the first years. Those early years, and my role as an induction year mentor and model reading teacher, have remained an important motivator in the work I do today teaching foundational education coursework in the areas of special education, inclusion, reading, and learning disabilities. I don’t believe the task of induction support should be shouldered only by school districts. I think teacher preparation programs should have a role in supporting their graduates. The National Council for the Accreditation of Teacher Education (2010), and other researchers, have suggested teacher preparation programs and school districts both need to be involved and connected to ensure continuity and coherence (Feiman-Nemser, 2001; Latham & Vogt, 2007; VanZandt Allen, 2013), just as faculty are part of the equation in other countries (Darling-Hammond, 2017). We should also make sure these approaches go beyond basic support and challenge our graduates to have academic and scholarly pursuits. It shouldn’t just be about the day to day support, but also continuing to build a foundation of ideas and resources that will carry an educator through their career. Do the deep dives in content and pedagogy. Complete action research. Stay in touch. Ask new teachers what they need. Teach them how to reflect. No matter your role in education (teacher, administrator, university faculty), there are myriad ways you can contribute to the retention, mentoring, and continued preparation of teachers in their first few years. If you are a new first or second year teacher (or new to a district) and your district offers induction support: please sign up. This is a chance to get advice, feedback on your teaching, a clearer understanding of policies and expectations, and improve your student outcomes (Ingersoll & Kralik, 2004; Strong, 2009). Expect that learning will continue. As a faculty member, I am going to take the next step here for me: supporting a first-year teacher in action research and writing and reflecting on it through the year. She asked, I listened. By now you’ve probably already read the first blog in a new series by Bev Chatfield. Watch for more planned reflections in this 10 month blog series chronicling some of the intellectual work of a first-year teacher and how we are working through it with action research, reflection, and dialogue. The first years are the most important in retaining teachers. How are you supporting first year teachers?How are you supporting teachers new to your school or district?